It is mandatory that everyone covered by a Greek insurance fund, collecting a Greek pension or intending to work in Greece have an Αριθμός Μητρώου Κοινωνικής Ασφάλισης or AMKA, as of January 1, 2010. 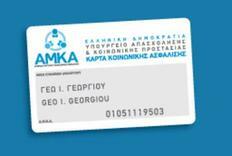 Most residents already have AMKAs, and everyone registered with a Greek social insurance fund should have received AMKA cards at their place of employment or residence, if the information on file was correct. Those without numbers are likely new arrivals to Greece, unemployed spouses/children of insured individuals, residents who cannot understand Greek or illegal workers. The original July 1, 2009 deadline was changed to October 1, after hundreds of thousands of people complained that public sector employees were ill informed and unprepared to deal with the onslaught of inquires and applications at the end of May. This caused the Ministry of Labor to temporarily disconnect their phones. *Article last updated March 13, 2013. Hat tip to ‘T,’ who suggested I write this article. What is an AMKA, and why is it mandatory? An AMKA, Αριθμός Μητρώου Κοινωνικής Ασφάλισης or Arithmos Mitroou Koinonikis Asfalisis translates to registered social insurance number or social security number. * I have also heard it called an SSFN or Social Security Foundation Number. It is a singular insurance identity that will replace all numbers issued by IKA-ETAM, OAEE (formerly TEBE/TEVE), OGA, TAYTEKO, TAYTOTE, ETAA, ETAP-MME, YPETHA, OPAD, etc., thus (hopefully) streamlining transactions pertaining to insurance, pensions and unemployment benefits. For example, I now show one AMKA instead of two different numbers with IKA and OAEE (formerly TEBE), though my unique details remain on file. The Greek government intends this to be the first step in integrating 13 social insurance funds, curbing public sector waste and reducing bureaucracy. It also hopes to inch closer to EU standards by improving transparency in the health care system, controlling improprieties in pharmaceuticals, combating tax evasion, and making it more difficult for employers to hire illegal workers and evade contributions. *Residents should not confuse the term ‘social security number’ in Greece with SSNs in America or TINs in other countries, which also act as tax numbers. In Greece, tax numbers are still AFMs and remain separate. Does it replace my health booklet or ensima? No. As a general rule, you should keep anything official that was issued by the Greek state. It is helpful to write your AMKA in your health booklet. — Anyone intending to work in Greece. You do not need an AMKA if, for example, you are retired and collecting social security payments from a country other than Greece, or are insured with a private health insurance company. It is not true that everyone living in Greece needs an AMKA. These rumors are being circulated in forums, and this is one reason I do not recommend them. Do I have an AMKA? You can check if you have an AMKA by visiting www.amka.gr and entering your name and birth date into the searchable database. *Note: This is not a foolproof way of checking. My birth date was entered incorrectly and my surname misspelled, so the database returned no results, even though I have an AMKA and received my card. The database says I have an AMKA, but I didn’t get a card. If your work or home address is outdated, your AMKA card went to the old address. You can change your address at a KEP Citizen Service Centre and have your card reissued and re-sent. The most important thing is you have an AMKA; write down the number and keep it handy. * Anyone who was mistakenly issued two AMKAs can inform KEP or their insurance company as to which number they’d like to keep. Otherwise, one will be chosen by authorities. Are IKA numbers the same as AMKAs? No, IKA AMAs are seven digits, and AMKAs are 11 digits. The first six digits are the day/month/year of birth, followed by five digits representing the city record and control number. For those who already have both IKA and AMKA numbers, they are listed separately in the upper left side of your quarterly ensima printouts. a) Police-issued Greek ID card (tautotita) or military ID. Minors under 13 years of age without a Greek ID should present a pistopoiitikou oikogeneiakis katastasis (certification of family status, issued from the οικογενειακή μερίδα/oikogeneiaki merida, which can be requested through KEP). b) a pistopoiitikou oikogeneiakis katastasis (certification of family status, issued from the οικογενειακή μερίδα/oikogeneiaki merida, which can be requested through KEP) or a similar certificate verifying family relationship translated into Greek, if from a country other than Greece (see, “Translations of documents in Greece“). A family relationship must be established for unemployed/subsidized spouses/children/parents who are indirectly insured through a family member. Non-Greek minors born in Greece need a lixiarchiki praxi gennisis (birth certificate from the lixiarcheio). a) a residence permit sticker/card to legally be in Greece. *Some applicants will be asked for additional documents, such as proof of AFM and mother’s/father’s name, which is found on the original document issuing the AFM (bebaiosi apodosi AFM). Can I change my status or contact details? Any KEP Citizen Service Centre in Greece can assist you in updating your information. Where do I get an AMKA? I prefer KEP because they keep longer hours, with some locations open on Saturday. All KEP offices are supposed to be open on Saturday, but I found that locations in rural or suburban areas with low foot traffic are sometimes closed. Under certain circumstances, people residing outside Greece may be able to apply for an AMKA without appearing in person, but this must be discussed with the relevant authorities and is decided on a case by case basis. If you are a Greek, EU or non-EU citizen abroad in need of an AMKA, Greek consulates/embassies are also supposed to have KEP services to assist you as of 2007. However, I cannot confirm this since I live in Greece and never access these services. It’s best to contact the location nearest you. See “Greek Consulates and Embassies Worldwide” if you cannot find one in the phone book or online. Because the AMKA card is laminated directly on the sheet of paper, the perforations do not work and could easily rip your card. I recommend using scissors. Just my two lepta. This site is extremely helpful. I receive a Greek pension but was totally unaware of AMKA until my checks stopped coming. I am sure that I am not alone in this situation. Called the Greek consulate and was informed that they cannot help; someone in Greece must do it for me. Greece previously didn’t require both an AFM and AMKA of everyone receiving a pension until recently, even though having an AMKA is mandatory since January 1, 2010. The requirement was changed because of new e-government services and mass fraud by thousands of families collecting dead relatives’ pensions. You’re not alone, but you should have received a notification several months ago to provide missing data by an April deadline, which was then extended to June. Lots of people didn’t take it seriously or their contact info wasn’t up to date, so thousands had their pensions temporarily suspended. If you contact your social insurance carrier directly (IKA, OAEE, other), they may allow you to sign a dilosi and provide other proof of identity to register. Never hurts to ask. Thank you for your kind words and sharing your experience. One reason I started livingingreece.gr in 2007 is a decade of frustration and dissatisfaction with incorrect, outdated or complete lack of information anywhere in any language. Greek gov’t websites didn’t exist back then and now copy my articles without permission for the English versions, as do expat guides. It’s a pleasure to help people like you, and thanks so much for taking the time to share your story and kind words. First of all, great article! Very informative. Since your mother works for the Greek government, she should know the answer and easily provide you with documentation, plus facilitate any necessary translation from Greek to English. mia madre da aprile 2013 non arriva la pensione dalla Grecia e in Italia ci hanno detto che non sanno il motivo . Solo oggi il consolato di Firenze ci ha detto che è necessario l’AMKA e se avevo dei parenti in Grecia per richiederlo tramite loro. Può mio zio richiedere questo? No, your mother must apply for the AMKA because her identity must be verified. This is the reason they stopped her pension payments. If unable to appear in person, alternative arrangements can be made directly with an IKA office by calling or writing them. Click the link in #1 & 2 for ‘IKA office’ and find the telephone or fax number. There are dozens of offices in Athens. Also note that most public sector offices in Greece do not answer emails; this is an advanced concept. I write you from Bulgaria. I receive a Greek pension until 2008. But April last year (2013) was stopped my pension payments. I have not an AMKA number. So, I take an AMKA number February this year (2014) and sent to IKA ETAM, but to present my pension payments is not coming, I not receive any answer or explanation. What I must to do in this situation? Thank you in advance. You need to call or fax (not email) a staff member at an IKA office in Greece. I run this website in my unpaid spare time and do not represent the government. However, my taxes pay for civil servants to assist you. Pour recevoir de nouveau ma retraite de l’IKA il me manque mon tax number,j”ai le numero Amka. Comment faire pour l’obtenir,a qui s’adresser ? et quels documents fournir? You get a tax number (AFM) from the eforia or Greek tax office. AMKA is mandatory since January 1, 2010, five years ago. Greece sent you many notices to inform you before the pension was cut. Please contact the Greek tax office to apply for an AMKA. Read the article for instructions. Thank you. I am not Greek. I do not represent Greece. I am not a lawyer and cannot represent you. I am a private citizen giving assistance. I worked in Greece a year ago. to my country I want to download a working experience of Greece. However, I do not know the security number . I have not received any card . How do I find the Greek security number ? You call an IKA or OAEE office, or get in touch with a KEP centre. Contact info is in the article above. Do i have to send that W-8BEN form or i can write my AMKA, is it the same??? What year health care was introduced in Greece ? IKA was established in 1934 and OGA in 1961.